Ok. I love plush. I make plush. I buy plush. I take pictures of plush. 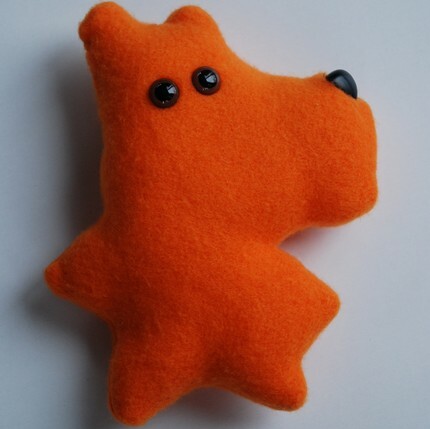 When I saw this little funky doggy from Jelly Bean Labs I just could pass him up. And I even had a reason other than just wanting him for my collection. It was my little nephews birthday and it made a perfect little gift. Jelly Bean Labs is a mother daughter x3 project. The girls are all under the age of 12 and and love to craft. They have been selling their goodies in local craft and art shows for several years and are now making them available on ETSY. They are all inspired by the imagination that youth has to offer, creating fun and fanciful art for all to enjoy. What an adorable dog! Love it! Your link isn’t working. It needs the ‘s’ taken off ‘labs’. Just helping.